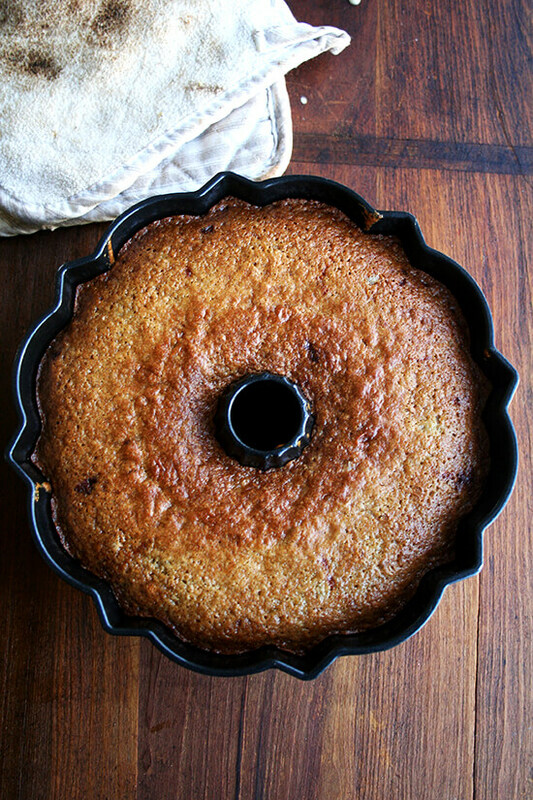 I don’t know how anyone could find fault in something as delectable as Teddie’s apple cake, as fun as the big apple pancake, or as glorious as the Balzano apple cake, but I happen to live with a few such people. And I know I shouldn’t take offense to a three-year old’s aversion to “texture” of any kind, but when I see a piece of cake picked to pieces, apples and crumbs scattered across the plate, my blood pressure rises. In an effort to please these little beings — seriously, there’s nothing like a toddler’s behavior at the dinner table to shatter my confidence in the kitchen — I called my old neighbor, Geri, from Virginia, to get her recipe for applesauce-yogurt cake, something she always seemed to have on hand this time of year, a cake my children (and I) couldn’t get enough of when we found ourselves across the street at her house. Geri started making this cake years ago when her father, who loved sweets, was advised to watch his diet. She found the recipe in some sort of low-fat, heart-healthy cookbook/website and has been making it ever since — for her father, for her own family, for her friends, for nearly every fall gathering and holiday. Made with 1 1/4 cups yogurt and 1 3/4 cups applesauce, this cake is one of the moistest cakes I have ever made, and I can assure you it does not taste like diet food in any shape or form. 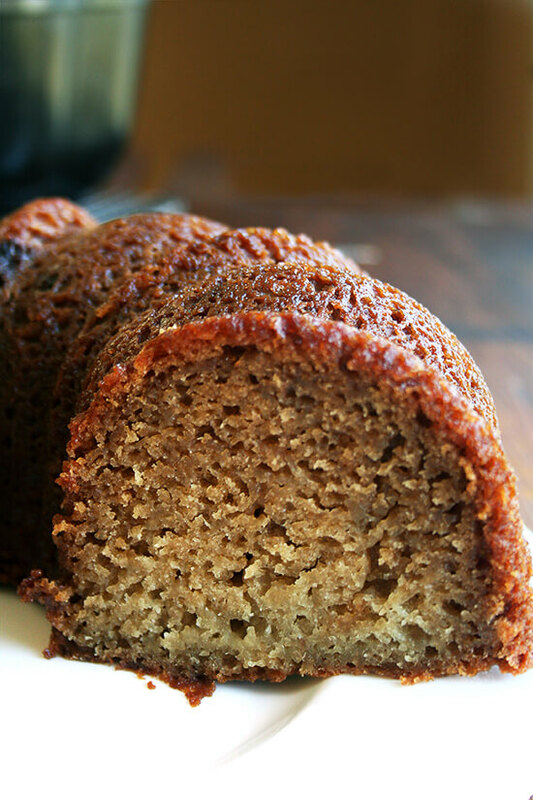 And unlike some cakes that get moister the day after they are baked, this one is moist immediately, no doubt a result of the quantity of applesauce and yogurt. Moreover, it bakes beautifully and evenly every time — I don’t know why I don’t use my Bundt pan more often — and it looks pretty to boot. Are you expecting company next week? This might be a good little thing to have on hand. 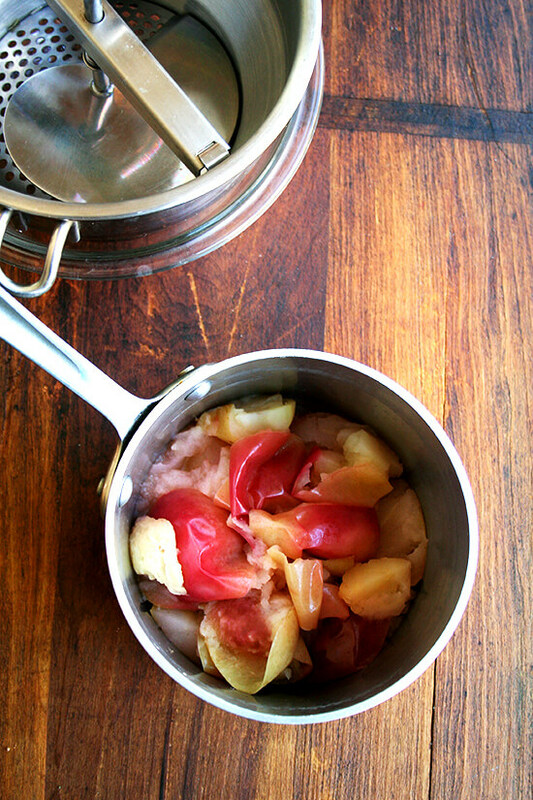 It takes no time to throw together — you absolutely do not need to make the applesauce — and it’s the kind of thing that can be enjoyed at any point in the day, early in the morning with coffee, later in the afternoon with tea. Have a wonderful weekend, Everyone. 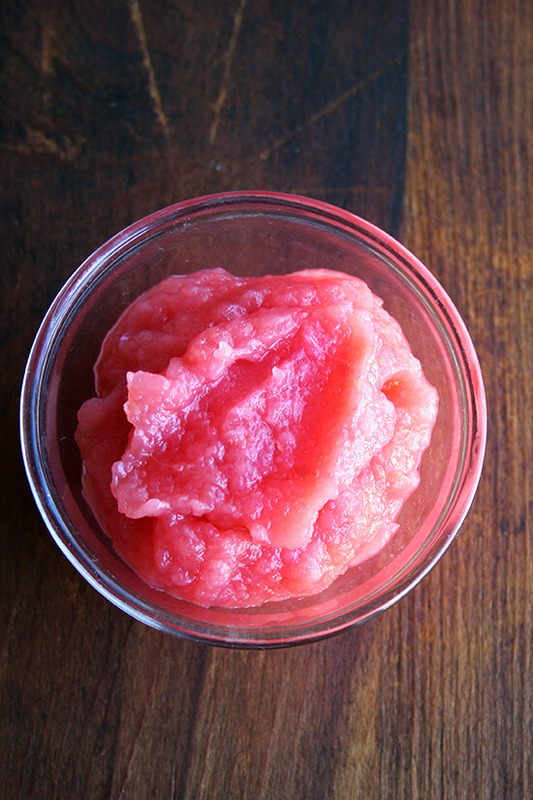 Can you believe the color of this applesauce? 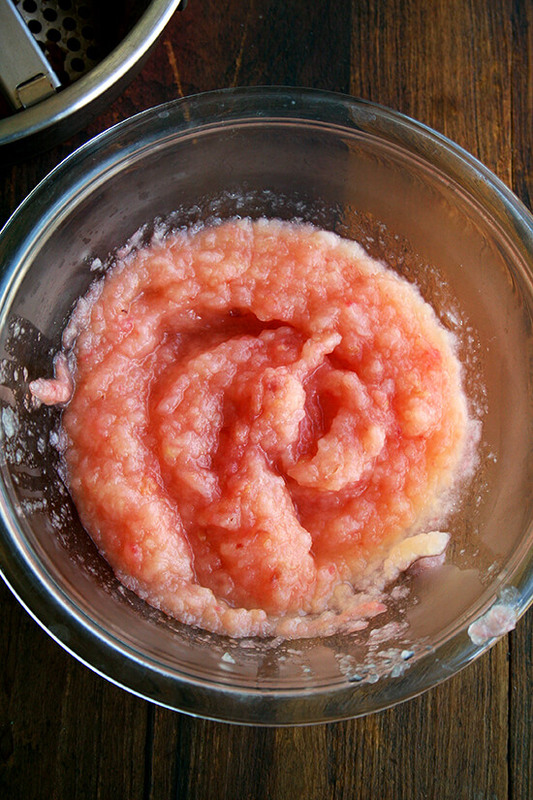 It doesn’t always turn out quite this brilliantly — see photos of other batch below — but the key to getting a beautiful pinkish hue in your applesauce is to 1. Leave the skin on the apples when you make the sauce and 2. Use the right kind of apples. I’ve been using Empires, which consistently produce a beautifully colored, not-so-sweet sauce. The skin on the Empires I used for this batch were particularly deep red in hue. 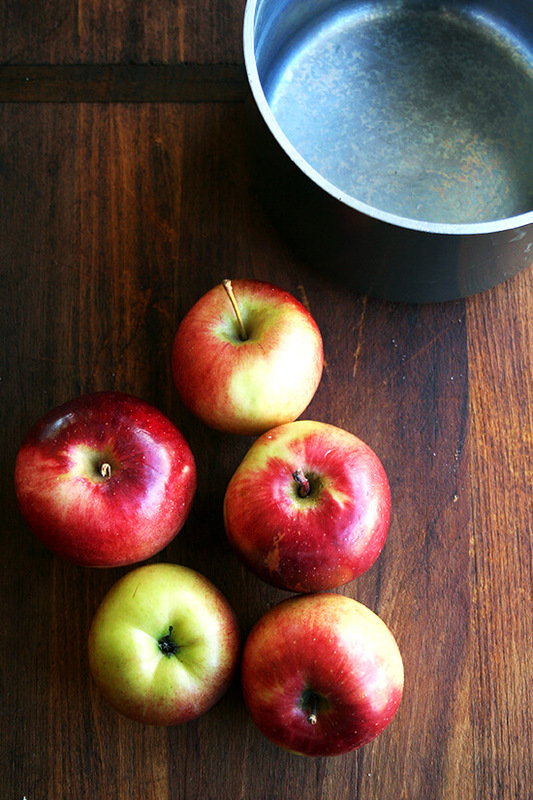 Macintosh apples will also create a nice pink sauce. Notes: I am sure some of you might want to cut back the sugar here, but I’m not sure how to advise, because I already cut it back by a quarter cup, and I promise promise promise you that this cake is not too sweet. Also, 2 cups of sugar for a cake this size isn’t inordinate. Teddie’s apple cake, which is about the same size, also calls for 2 cups of sugar. I have made this cake twice now, once with cinnamon and once without (using vanilla in place of the cinnamon), and I like it both ways. It all depends on your preferences. If you’re in the mood for all of those fall spices, use cinnamon along with a pinch of allspice and cloves. If you’re already over the spiced taste, use vanilla. 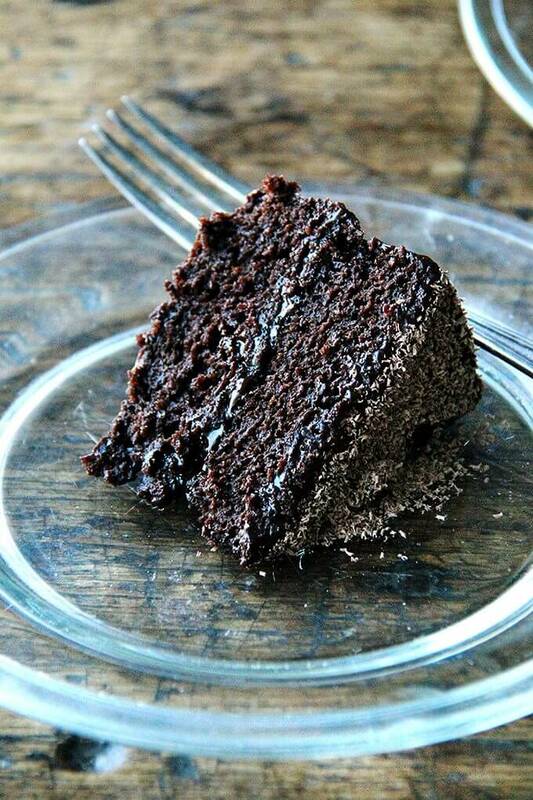 Just know that the texture of the cake will be divine no matter what spices you use. Also, Geri uses Dannon plain nonfat yogurt, and her cake always came out incredibly deliciously, but I get nervous about these things sometimes and can’t keep myself from buying the full-fat tubs. I used Stonyfield whole milk plain. 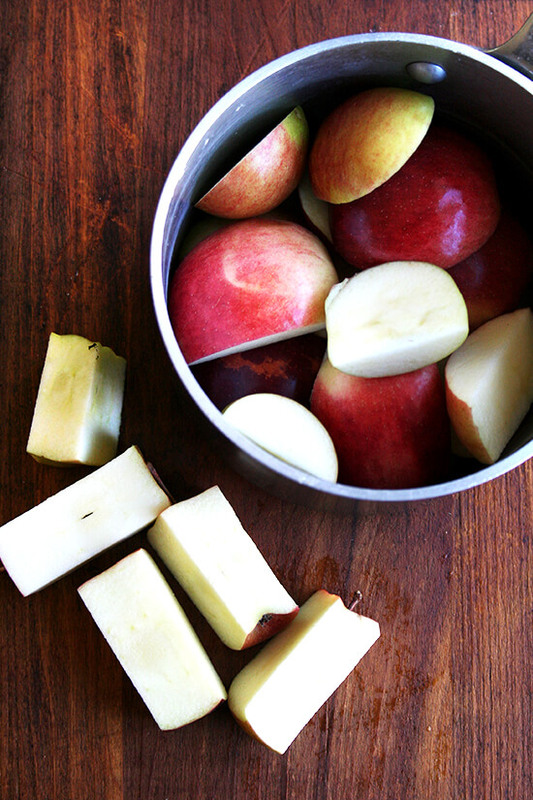 You absolutely do not need to make the applesauce, but if you’re feeling up for it, go for it. While you’re at it, maybe make enough to serve at Thanksgiving, too? 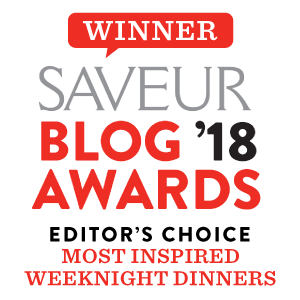 Finally, some of you might like an alternative to the vegetable/canola oil, and I’m not sure how to advise on this one either. I haven’t explored baking with coconut oil enough to say how it might affect the texture. I’m thinking the best substitute might just be an olive oil (not extra-virgin) or grapeseed oil. Preheat the oven to 325ºF. 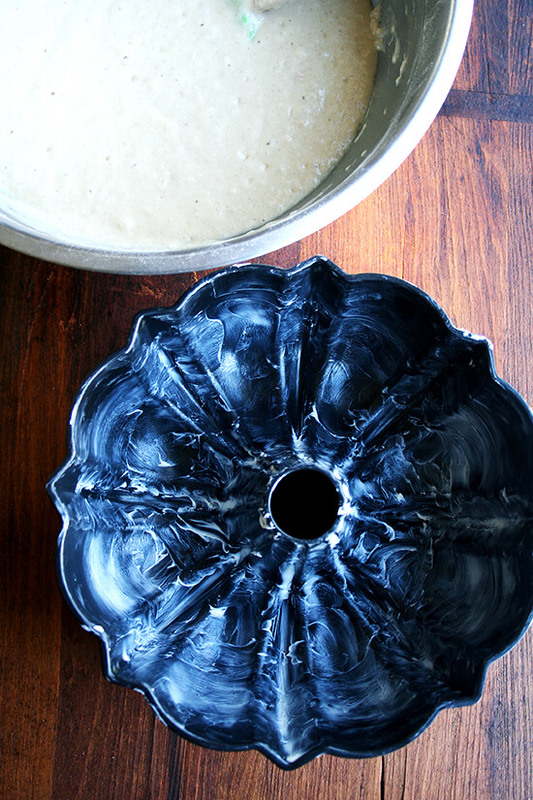 Grease a 12-cup Bundt pan. 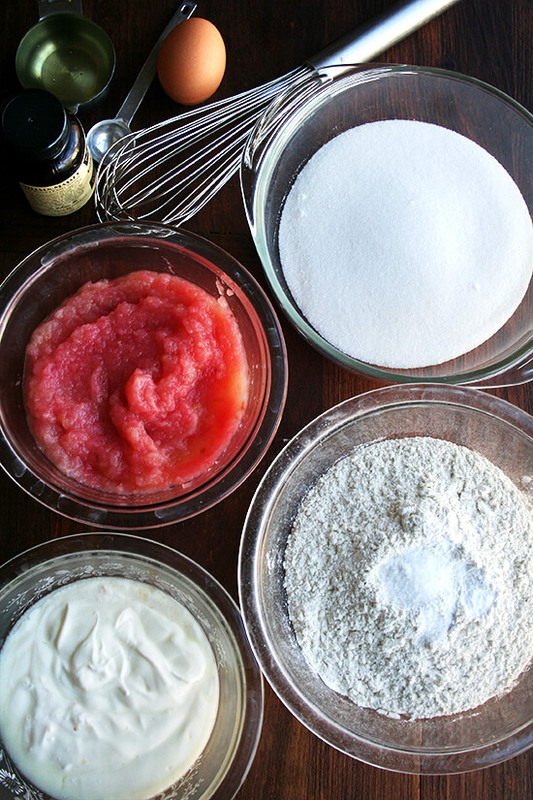 In large bowl, whisk flour, sugar, baking soda, baking powder, cinnamon (if using) and salt. 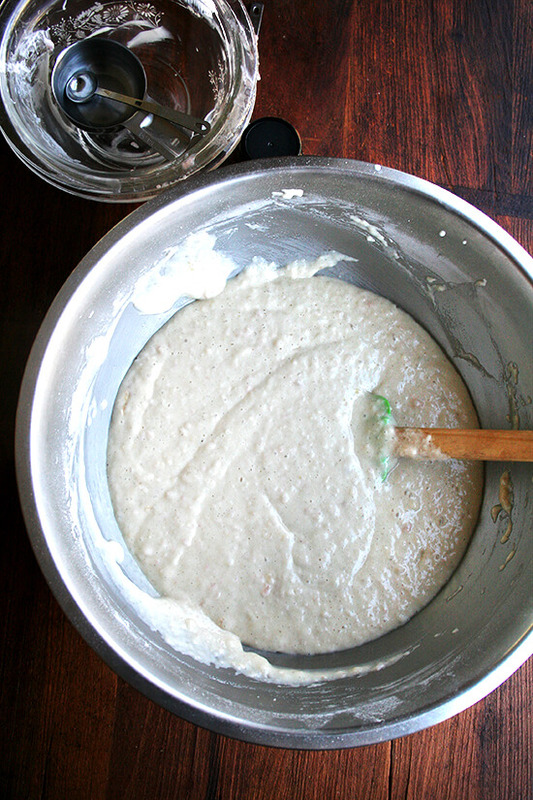 In a separate bowl, mix applesauce, yogurt, egg, oil and vanilla. Add to dry ingredients and stir until just combined. Bake for 50-60 minutes, or until toothpick inserted in center comes out clean. Mine have consistently been done at 55 to 60 minutes. Cool 15 to 30 minutes or longer — I think I let mine sit for 45 minutes before turning it out onto a cooling rack. Before turning it out, you might want to run a paring knife around the center circle to loosen it a bit. I’m quite a fan of Teddie’s Apple Cake, but will be sure to give this one a try as well. Happy Thanksgiving!! Me, too, Sarah, and if it weren’t for my kiddos, I would have never strayed, but this one is quickly becoming a family fave! Alexandra, I hate cake so how can I adapt this into a milkshake or a dinner roll, perhaps? Please advise. I have been lurking and loving your blog. Thanks for the easy, kid friendly cake! We will try it, with no alterations, as soon as my kids and I can stop making your delicious blueberry buttermilk cake! Haha, I love it, honestly, you totally had me! So funny. I wish I had more time to experiment with all of the possible vegan, low-sugar, gluten-free, non-dairy variations, but alas there is only so much time in the day (and so many carbs I can fit in my body) 🙂 I really have learned so much and tried so many new products/methods from all of you crazy commenters :), however, and for that I am so grateful. Thanks so much for writing in! And I’m so happy to hear you like the blueberry buttermilk breakfast cake. Have a great weekend! Um, I am actually crying a tiny bit after reading that comment. SO funny. I love to experiment and this looks great. I plan to try it with my paleo flour blend and coconut oil and report back. The photos are beyond gorgeous as always! Haha, I love it. And I will be so curious to hear how it turns out. I have never heard of paleo flour, but I now know exactly what I will be giving to my Paleo friend who absolutely adores baking and doesn’t do it as often as she used to. Thank you for your kind words. Happy Thanksgiving if I don’t hear back from you sooner! Oh my gosh, that was so funny! I was thinking the same thing when I read all the notes – she’s trying to fend off crazy commenters! I just use melted butter in baking instead of vegetable oil. Haha, oh no! Maybe, I need to change my notes verbiage 🙂 great tip on the melted butter. Will try that. I am picking up 25 pounds of Pink Lady apples on Tuesday. Guess I know one way I’ll be using some of them. I imagine this would freeze beautifully and have a itch to bake as a loaf instead of bundt for freezing purposes. What do you think? Call me crazy but I’m getting ready to fire the oven up and make this tonight. I think it will be perfect for Sunday morning breakfast. I have a batch of cranberry apple sauce in the fridge that needs some love and I really want to get some of this cake in my face. So it’s a win-win. Will let you know how it goes with a loaf pan. Here’s my report…greek yogurt works just fine….baking in a loaf pan works but you definitely still need to bake for 50 to 60 minutes Mine kind of sank down which might have been due to my oven being wonky or maybe even needing to bake at 350 instead of 325. I’ve got another batch of applesauce cooking on the stove right now so I imagine I will be snacking on another one of these cakes very soon. We nibbled on some while it was still warm and it is lovely. I used 5 spice and garam masala instead of cinnamon and think next time I might spice it up just a bit more. However you like your cake spiced, this recipe will be very adaptable. PS, if you scale the recipe down by half it makes enough to fill a single loaf pan. Oh Wendi, you always give the best/most detailed reports. Thank you! Glad to hear about the Greek yogurt and the loaf pans, and I can totally see how the center might sink in a loaf pan because the batter is so wet. Another friend recently made them — she sent me a photo — and she baked them in 4 smaller loaf pans, which I am sure helped prevent the sinking also. You are so creative with your spices! I do not use garam masala enough, and I never think to use it in sweet dishes. Fun! What do you think about using plain greek yogurt? Amy — I think that will work just fine. Let me know how it turns out! I’m curious. The whole milk yogurt I have been using is not as thick as Greek yogurt, but it does have a nice tang, so I think Greek yogurt work just fine. I just ordered my first bundt pan and this will be my debut cake! Do you think this would freeze well? We are hosting trivia night after Thanksgiving and I want to prepare a bunch of things in advance. Darcy, I am going to start baking everything in a Bundt — it feels so old fashioned to me, but there is a reason why they were invented…everything comes out well in a Bundt pan. Maybe I’m being a little overly enthusiastic. Anyway, as for freezing, I think it will freeze well, but I’m thinking (as suggested by Wendi) that it might make sense to bake these in loaf pans 🙁 if you are short on freezer space? Just a thought. 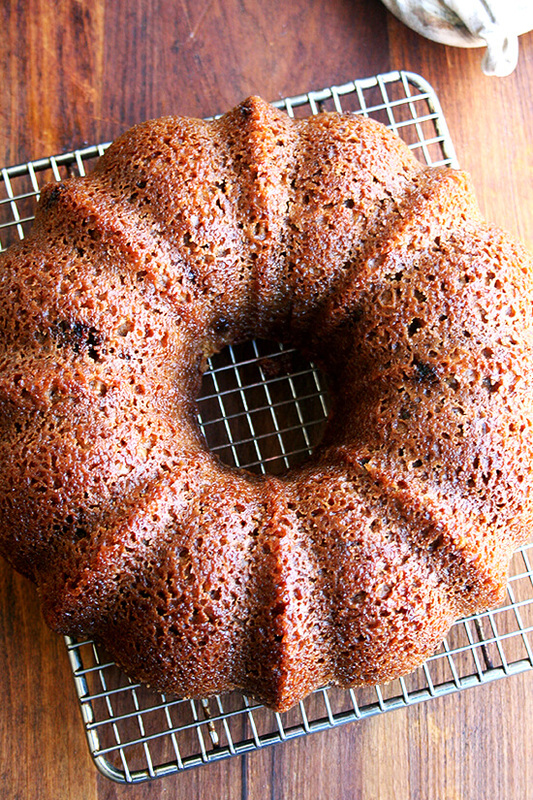 But if you have space, just bake it in the Bundt! 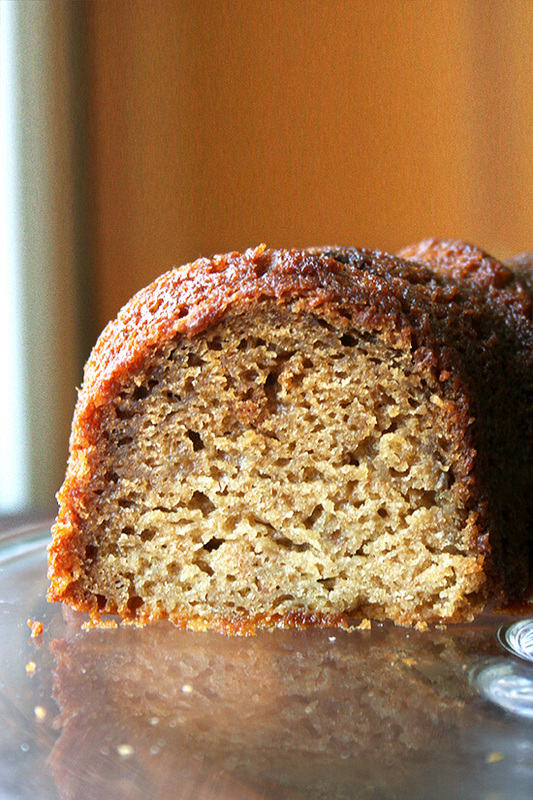 I just made this with 2% Fage Greek yogurt and olive oil in a loaf pan (my bundt is in storage!) I only have one loaf pan so the excess went into mini muffin tins (removed the muffins after 20 mins). Both the loaf and the muffins came out very moist and delicious. They almost take like honey cake! Thanks for another great recipe! Yay! Wonderful to hear this Sybil! Thank so much for reporting back with your variations — that’s always so helpful for other Readers. Happy Thanksgiving! 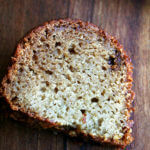 I have a banana bread recipe that uses yogurt instead of butter/oil and it’s so much healthier! 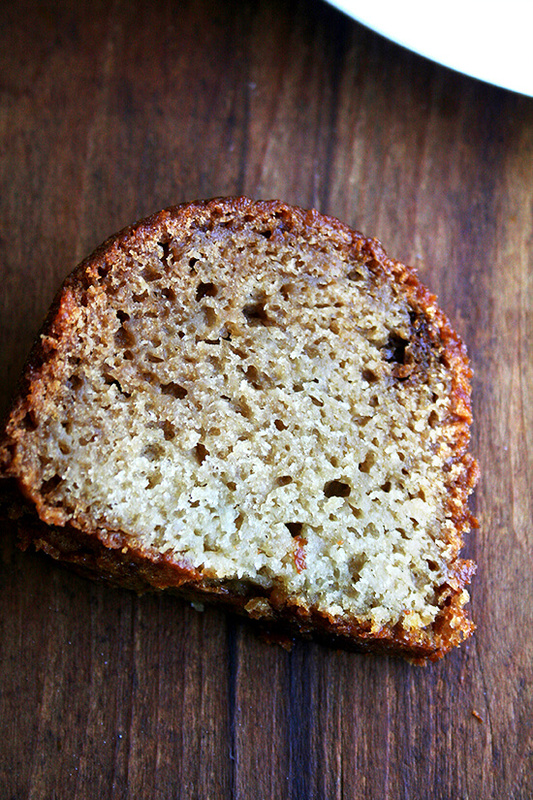 Although it gives the banana bread a bit more bread-pudding like texture than cake but I like it. And secondly if I don’t have a food mill what would you recommend? Can I just squeeze it through a sieve? I think you’ll find the texture of this cake to be similar to the one you like. I know that bread pudding texture you are describing, and while this isn’t quite like that, it is incredibly moist. And, I think a sieve is a really good idea. 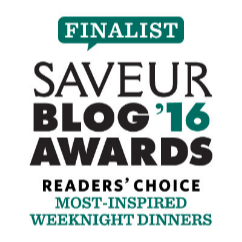 There aren’t many great alternatives — I don’t think a food processor or blender is a good idea, but a sieve or even maybe a potato ricer? Do you have one? I like the idea of adding horse raddish that sounds delicious! Using it as a replacement for oil sounds odd…I assume that applies to baking mostly. I thought of the food processor but it looked like you used the food mill to shed the skin which is why I thought sieve. I don’t have a potato ricer either. I will try it with the sieve and see it how goes. Oh yes, definitely re applesauce for butter/fat/oil in baking vs savories. Let me know how the sieve works out! Just to let you know, I tried this with half white whole wheat flour and melted coconut oil for the vegetable oil, and it came out delicious. So tender it practically falls apart and insanely moist. Made it in two loaf pans so I could freeze one but, um– I don’t think it’s going to make it into the freezer! Will definitely make this again and have already recommended it to a friend. Yay! Sara, thank you for experimenting with coconut oil! So many people will be grateful for that. I need to add a note to the recipe. And happy to hear that the white whole wheat flour works, too, and most of all, I am so happy you like it! Thanks so much for writing in. What a beautiful cake. I bet it tastes wonderful. In fact, this entire post is really beautifully done. Your photographs are gorgeous, so enticing, and the step by step lesson is thorough and clear. Brava! Thank you, Adri, you are really sweet. This looks so wonderful – and just before my family descends on my house for Christmas! Do you think this cake works for a breakfast treat, or would you say it is strictly a dessert cake? Breakfast absolutely! I almost prefer it as a breakfasty-, snacky-, tea-time cake than an after dinner cake, but we seriously eat it all day long. Happy holidays and happy entertaining! Just in the middle of baking the applesauce yogurt cake,to which I added walnuts and vanilla Greek yogurt.I also ground cinnamon sugar on top.Baked them in muffin tin for 55 min. and they are definitely soggy (bread puddingly inside) but taste delicious. I think I over-mixed the ingredients,to start with, then probably didn’t let them bake long enough or let cool enough after. They just don’t look cakey inside. Now doing some in small loaf pans and will bake longer and be more patient. Merry Christmas.I’m doing the thyme rolls tomorrow morning. Jane, sorry to hear about the muffins — the batter definitely produces a very moist cake, but i’m surprised it didn’t bake better in muffin tins because it baked well in the mini loaf pans I used. How did your loaves turn out? Sorry I’m just getting to this! Happy New Year! Sarah, more and more I am noticing how much the material of the pan makes a difference in the final product — it must have something to do with conduction of heat or something way over my head. This does make an excellent cake, but I understand the appeal of mini-size anything. Hope your son liked them! I’m so addicted to buying gadgets right now, who has time to actually cook! Last night was a food mill from BBB, going to try to make strawberry applesauce this weekend while more snow is falling! Spring! Where are ya girl?? XXOO! So fun, Laurie!! I can’t buy enough gadgets. 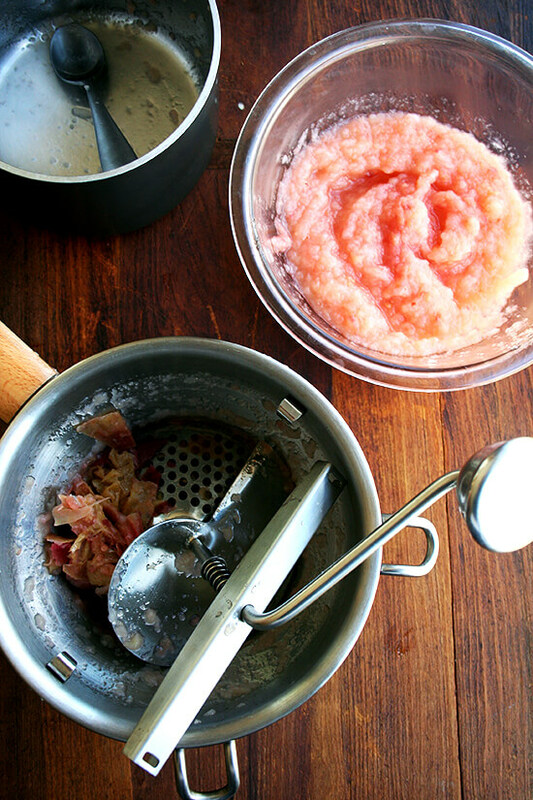 I love my food mill — don’t use it that often — and can’t imagine making applesauce without it. And I know, it has been a crazy few weeks…winter break for the kiddos, road trip to see my parents…finally getting back into the swing of things. Hope you like the applesauce! Love the fact it only uses one egg. Very moist and delicious. I cut back on the sugar a bit since I used lemon flavoured yogurt. Also added orange rind – yum! Thanks for sharing this recipe. This can definitely be eaten anytime of the day. wonderful to hear this. 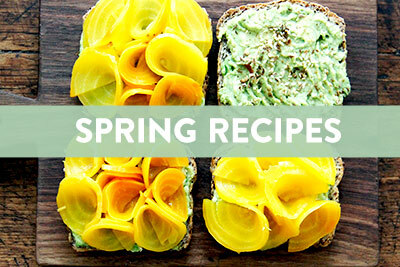 Love the idea of lemon yogurt in this! Definitely going to try that. I adapted this to use Stonyfield Farm French Vanilla yogurt (something we usually have in the fridge). I reduced the sugar to 1 2/3 cups and the vanilla to 1/4 tsp. Today I made the recipe in two 9×5 inch loaf pans (one to keep and one to give) and cooked them for 50 minutes. They came out perfect, but a tad small. I think two of the next size smaller loaf pans will be next!! Yay! So happy to hear this, Liv! Glad to know that the sugar can be cut further. I am so intrigued by the use of sweet potatoes, too. Fun! 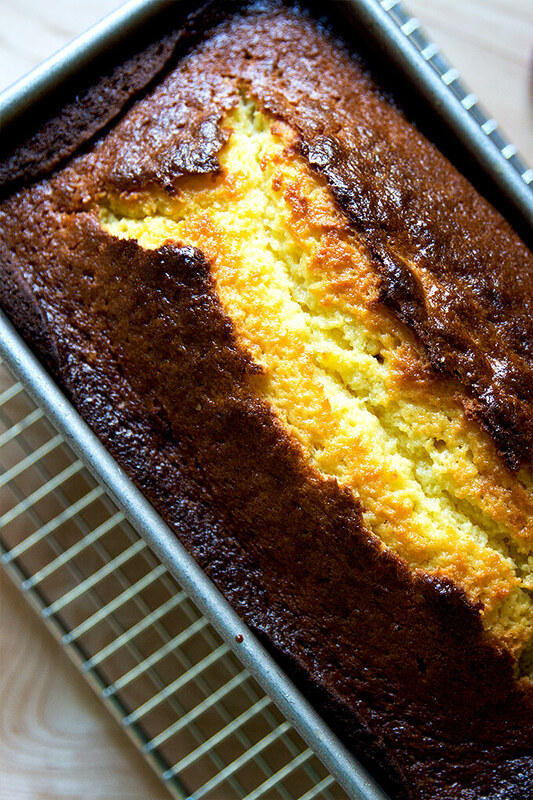 This cake has become a breakfast staple in our house – loved equally by the adult kids and the 2 year old grand-baby. I now substitute 290g whole wheat flour (120g/cup) for the white flour, switch the full amount of white sugar to dark brown and toss in a large handful of raisins. Then I bake in 2 loaf pans for 60-65 minutes. Wrapped in plastic wrap, they freeze beautifully! Awesome! Thanks so much for sharing your variation! Love the idea of using whole wheat flour. Thanks, Lindsay! Do you think reducing the 2 C of sugar will change the cake much? At most, how much would you recommend reducing it by? I wouldn’t use less than 1.5 cups, but honestly, the cake does not taste too sweet — promise! Loved it! I used cake flour, TJ’s chunky applesauce, Greek yogurt, 1 1/2 c. brown sugar, cinnamon and vanilla. A keeper for sure. I may add toasted pecans next time. Wonderful! So happy to hear this, Gretchen. Alexandra, I’ve made this two more times and everyone LOVES it. The one I have in the oven now has frozen blueberries added. Thanks Alexandra. Wonderful to hear this, Gretchen! Hi Alexandra! This was delicious and already has a permanent spot in my recipe binder. Thank you so much! For the record, I used grapeseed oil in lieu of canola/vegetable. It worked wonderfully. Thanks again for this fabulous recipe. My husband and kid are going to have to fight me for a slice of it. Ha ha. I first made this cake for my daughter’s first birthday (almost 3 years ago) and since then it has become the requisite birthday cake for all family members in our house! I absolutely love this recipe. The last time I made it I only had a scant cup of yogurt so made up the difference with sour cream and it worked out lovely. 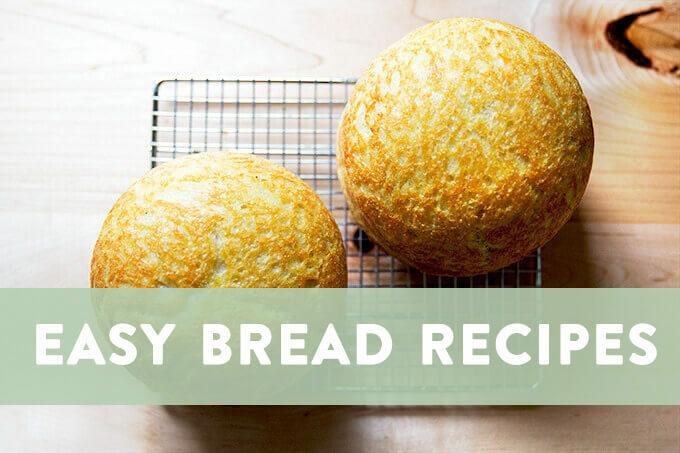 Thank you for such a wonderful recipe that will be in our family for years to come! So happy to hear this, Christina! I adore this one, too, and don’t make it nearly enough. It’s so moist and flavorful. Thanks so much for writing in! Very tasty! I followed the recipe using a loaf pan and baked it for a little under 60 minutes. My 2 year old and husband really liked it! I hope to make this often. 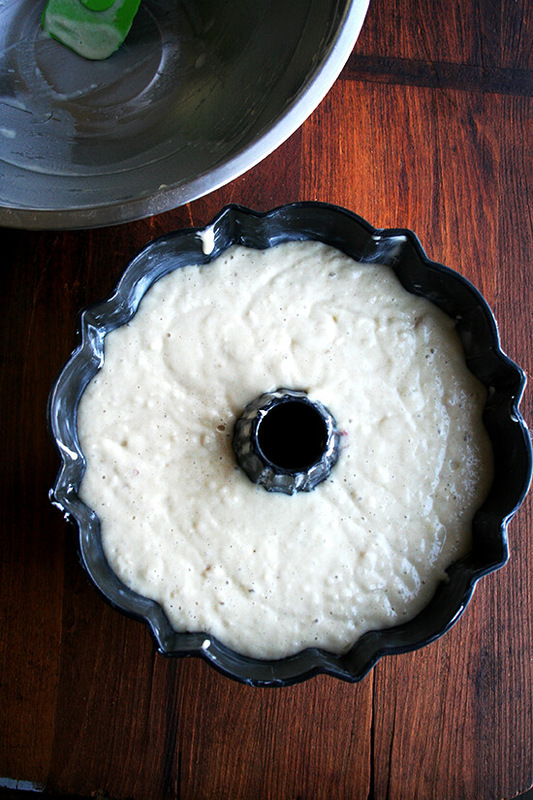 This is a fabulously moist cake & is my go-to recipe. When I cook the applesauce, I add brandy & sugar-free caramel flavor; I use half cake & half AP flour; I use a mix of white, brown & coconut sugars; and cinnamon, pumpkin pie spice & extra nutmeg. This has become our most loved, favorite cake. Thanks so much! Oh yum, sounds so good, Carolyn! Love all of your adjustments. You’re making me excited for fall! Hi Alexandra, thanks for the wonderful recipe! 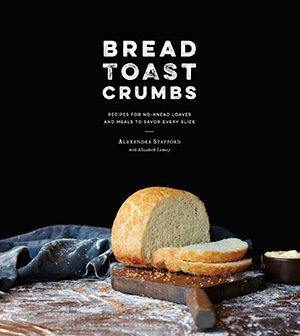 I am a few years behind the ball, but I only found your site several months ago when I discovered your wonderful peasant bread (it was probably around when your book was being promoted. Congrats!). I made your/your mother’s peasant bread nonstop for a couple of months! I’ve systematically gone back as far as my RSS reader will let me and bookmarked a ton of wonderful recipes you’ve shared over the years. This one I made very recently with some apple and pear butter I had to use up. I used those fruit butters in place of the applesauce (two separate cakes) and then cut way down on the sugar to account for the higher sugar content in the butters (down to 1.5 cups for the apple butter cake, and 1 cup for the pear butter cake). I also used lowfat plain greek yogurt and tried olive oil for the pear butter one. The pear butter one I was making for my father, who is also needs to watch his diet. They both came out wonderfully, and even the pear one that had a lot lower sugar was plush and moist and my dad loved it so much my mom asked me for the recipe. The apple one I took to work and it disappeared in a very short amount of time! I need to try it again sometime with some applesauce instead! Thanks again! Completely delicious and addictive ❤️! I have made it several times with different additions each time. My favorite so far is to use almond baking emulsion and vanilla in equal measures, a cup of walnuts and cup of Craisens. I also cut the sugar by using a cup of Stevia and a scant half cup of brown sugar. I am going to experiment with fresh cranberries tossed in a little flour and maybe a layer of chopped fresh apple in the Bundt pan first , adjusting the flour up a little as the Craisens made it a little too sweet for the prediabetics in the House but still ridiculously delicious. Every variation on the theme has been so incredibly yummy that I meet family members in the dead of night in the kitchen nicking a piece. Thanks for a great recipe. 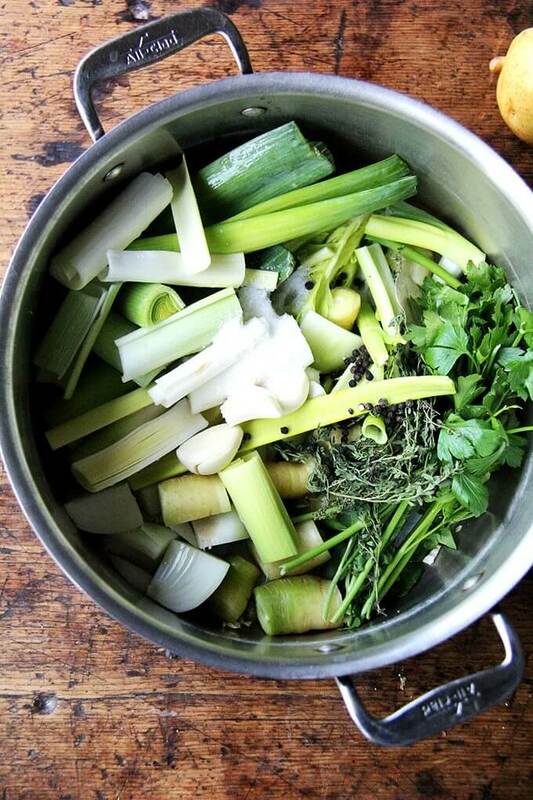 Of the many recipes on your site I have made, I had never made this one until this morning. I happened to have all the ingredients on hand (apples sauce freshly canned last week). I ended up substituting about half of the applesauce with applebutter (my apple butter is basically deeply spicy and concentrated applesauce anyways!) and reduced the sugar just a tiny bit to 1 1/2 cups as my applebutter had sugar already and so did my yogurt. It turned out wonderful! What a great morning breakfast cake! We all love it .i ran short of yogurt.add the rest with milk .great .ithought it wouldn’t work. But it did.